I thought that Auschwitz might explain it. That's why I went. To learn. To know. But nothing can explain what happened here. No building, no picture, no book, no movie, no first-person account, no rooms full of shorn hair, dry as dust, or broken eyeglasses, rusted and entwined, or mounds of shoes and abandoned suitcases. Yet this is all that remains. A platform shoe of faded red, a sandal with an ankle strap, is one of thousands piled behind glass. It tells a story. It's a shoe that a young woman with shiny hair and a zest for life would have worn. I look at it, discolored now, and wonder if its owner wore it on her long transport to this place and in line as she walked to her death. Or if she packed it in her suitcase, with all of her other best things, in hope of a better day. The Nazis exterminated some 11 million people between 1933 and 1945 in camps they built throughout Europe. The exact number is unknown, because in 1942, they stopped counting. Auschwitz was their biggest and most efficient death camp. It was an abandoned prisoner camp in the southwestern part of Poland, and they claimed it for their own when they invaded. They didn't fix it up. 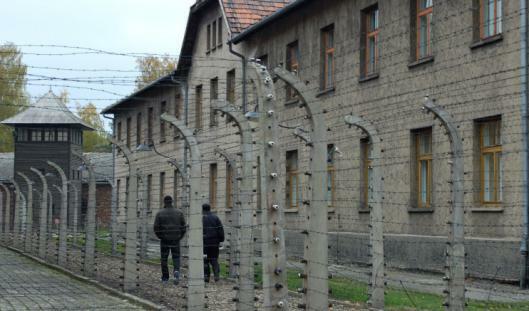 They expanded it, turning this one camp into three - Auschwitz, Birkenau, and Monowice - so that they could kill people faster and more efficiently. They evicted all the Polish residents from the area, about 1,000 of them, then converted their farmhouses into prisons and gas chambers and their fields into a maze of barracks separated by electrified barbed wire that stretched for miles. The mass graves? The pyres where the bodies were burned? The ash from the bodies? The SS kept these among thick groves of trees, careful to hide what they were doing. My visit to Auschwitz last week brought me face to face with this past. In photos that line the walls of what is now a state museum, I saw the eyes of innocents condemned to death. Back home now, the fear and incomprehension in those eyes remain with me. Until 1942, the Nazis took pictures of all the men, women, and children condemned to death at Auschwitz. But as more and more people arrived for extermination, they abandoned this. Those headed for the gas chambers were marched straight there and eliminated, no names asked. And those chosen for work were branded with numbers, no names needed. Polish prisoners were the first to be gassed at Auschwitz. There are hundreds of black and white pictures of these men and women, young and old, in their thin prison stripes, their heads shaved, interchangeable except for the looks in their eyes. A smaller wall holds photos of children. Dr. Josef Mengele insisted that each child be photographed three times, facing left, middle, then right. The black and white shots look as if they could have been taken in one of those machines that you duck into at an amusement park; click, click, and you have a strip of film. Except that these children are wearing prison clothes and are not smiling. One girl, 10, maybe 12, is puzzled in the first pose, sad when she is facing front, and in the last frame, when she is looking off to the right, you can see a single tear. Outside, lining the main street of Auschwitz, where a band played each day, where the great Nazi charade was in full force, are tall, green trees. The dead had planted them, birches and Lombardy poplars. Their beauty contrasts with everything around them. The prisoners were forced to line up on this street for roll call. Sometimes when they were being punished they stood barefoot in the snow for hours. They passed out. They fell down. They were shot for not standing up straight, for moving too slow, for asking to urinate, for not asking to urinate, for sport, for recreation. The tall trees saw all this. Down the main street, inside this prison is another prison - underground, dank, rat-infested, no light, no latrine - where men and women were kept until they were forced to strip naked and marched outside to be shot against a wall. SS men killed with abandon and brought home with them at night the booty from their slaughter. An infant's sweater. A shawl. A toy. When I was a child and read "The Diary of Anne Frank" and all the other books about people in hiding and children who never grew up, I wondered at the kind of people who did these things. How could they? The world has changed since the 1940s. Countries and soldiers and militants can't hide what they do anymore. There may be indifference now, but no one can plead ignorance. The Nazis duped the Red Cross. This couldn't happen today. In 2002, after journalist Daniel Pearl was kidnapped and beheaded in Pakistan, I watched the video and wondered how someone could do this. I didn't make the connection that for more than a decade there was an endless line of Daniel Pearls, one after the other, being slaughtered, only we didn't see. Auschwitz didn't tell me why. But it showed me how. Beverly Beckham can be reached at bbeckham@ globe.com. Listen to Beverly's weekly podcast at boston.com/news/podcasts.